When I first saw the trailer of Ek Villain , it made me realise that bollywood mainstream actors never really explore playing dark characters , out and out dark characters . If I have to think and really try to remember a good negative performance , I’d have to as far back as Shahrukh in Darr and Baazigar or Madhuri Dixit in Anjaam . So I was really excited seeing the trailer , but didn’t really get my hopes high as this being a path breaking movie. I was sure about one thing though , Riteish Deshmukh was going to a good job , and I wasn’t mistaken. The film suffers from a shoddy script , boring cliches and some really irritating characters , but amidst all this , there are some real moments of chills and thrills . The biggest problem with this movie was editing , whenever the movie picked up pace , a flashback came and slooooowed things down. The movie starts of on a real high , but bam we’re 2 years back in Goa….RD starts on a killing spree , they go into in depth details of his family , why he does what he does . I mean , were we ever interested in knowing why or where the Joker got his scars? No right? It was a part of his personality.The movie could have easily been cut short by at least half an hour and the film would have been totally different. Riteish Deshmukh effortlessly slips into a dark shade(dark, not grey) . And this movie makes you wonder why he keeps doing films like Humshakals and Housefull . He plays his part of the guy with suppressed anger , humiliation , ignored by others and the same guy whos just waiting for a chance to release that anger , find peace , in a kill , watching the blood drain from a victim and a monologue with her while she dies . There are places where he comes up short on the anger , but the madness … you can see it in his eyes . Siddharth Malhotra has also come good shedding his chocolate boy image after SOTY and Hasee to Phasee. He plays the role of a lost angry young man driven to crime , then saved by the love of his life , Shraddha Kapoor. Siddharth and Riteish take movie to some real highs before the director gets sidetracked . He starts dwelling on flashbacks , the side stories of Riteish and Siddharth , pointless songs instead of focusing on the real plot. The roles of all 3 of them could have been cut short . But we’ve got to deal with what we’ve got. 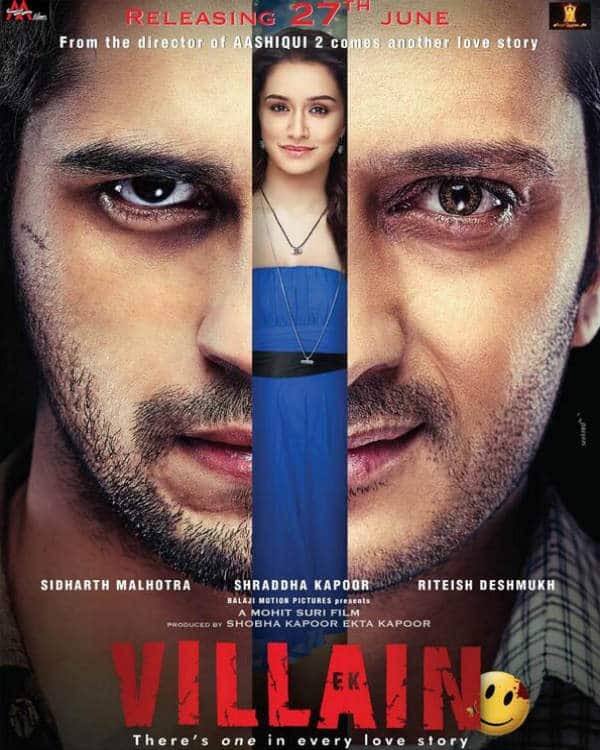 Ek Villain tries something different , the execution aside , they deserve an applause for the effort itself. And a stand up ovation for Riteish Deshmukh, I hope he experiments a little more with the movies he does.